Dr. Huang is the Director of Cytopathology and Program Director for Cytopathology Fellowship. He is currently an Associate Professor in the Department of Pathology with expertise in cytopathology and gynecologic pathology. He is also experienced in performing and interpreting fine needle aspiration biopsies. Dr. Huang received his Ph.D. in Biomedical Engineering from the University of Virginia and M.D. from Albany Medical College. He completed his pathology residency and fellowship training in Women’s and Perinatal Pathology and Cytopathology at Brigham and Women’s Hospital/Harvard Medical School. 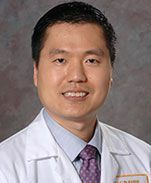 Dr. Huang served as a faculty member at the Department of Pathology and Laboratory Medicine at the University of California, Davis before joining the University of Washington. Dr. Huang is board certified in Anatomic and Clinical Pathology and Cytopathology. He is an active member in professional societies and has been invited to present in national and international conferences. He serves on multiple national committees including updating the cervical management guidelines. He has published in the field of cytopathology, gynecologic pathology and cancer research, and has contributed book chapters in pathology text books.